Whether you need a small ticket booth for issuing admittance to a parking lot or a large portable building that can handle thousand of visitors, PortaFab can create your solution. Our standard line of pre-assembled buildings range in size from 3' x 4' to 8' x 16' and feature sliding glass windows, fully functional electrical systems, and a durable welded, all aluminum construction that stands up to elements without rusting. 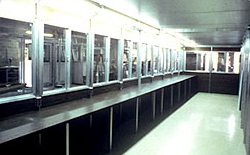 Optional climate control systems, cash drawers, and counters can easily be incorporated into any building to transform it into a cashier or ticket booth. All booths are shipped fully assembled and ready for immediate occupancy. All you have to do is hook up the power.